Product prices and availability are accurate as of 2019-04-26 09:14:24 UTC and are subject to change. Any price and availability information displayed on http://www.amazon.com/ at the time of purchase will apply to the purchase of this product. 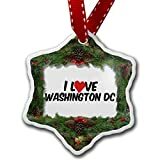 Celebrate the beauty of the our Nation's Capital this season with this new Washington D.C. Christmas Tree Home Ornament! 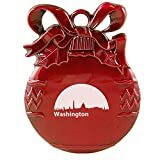 The ornament is a silver sparkle round glass ball with the title: "Washington D.C." written in a beautiful Red Print with the silhouette of the Nation's Capital in the background. Also; features an ornate hook hanger at the top. 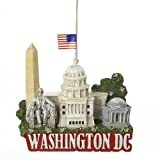 Color: Silver Sparkle with Red writing and blue silhouette of buildings in the skyline. 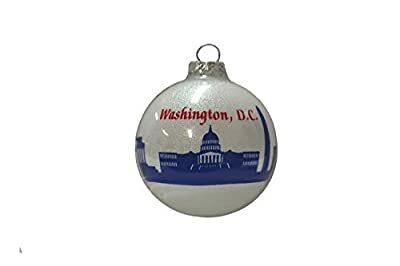 Dims: 3" x 3" x 3" Ball.